Jonathan Strange & Mr. Norrell (♦♦♦♦): This BBC adaptation of the eponymous novel by Susanna Clarke, recounts the feud between the two greatest British magicians of the age: Gilbert Norrell and Jonathan Strange, who came to restore English magic as prophesied by the book of the Raven King. Only when a faire king—or is it the devil?—enchants Arabella Strange, Jonathan’s wife, and steals her away, Jonathan and Norrell join forces to bring her back and fulfill the entire prophecy. This period drama takes place during and after the Napoleonic Wars. It is a quintessential British drama with magic as a twist. It has great (but not Hollywood style) special effects. I confess myself curious of what premium cable channels like HBO, Showtime, or Starz, would have accomplished with the same material. Addictive, entrancing and very, very dark, Jonathan Strange & Mr. Norrell is a cautionary tale for those who dabble in magic, as they may summon forces beyond their control. Black Sails (♦♦♦♦): I've been watching Season 1 of this Starz pirate show that is filled with historical anachronisms particularly in speech, but I can't resist a good adventure. Though so far the taking of L'Urca de Lima (a Spanish treasure galleon) is still in its planning stages, it promises to be the mother of all battles to capture a humongous treasure even by today's standards. So far the action is only on land...Will Captain Flint and his crew make it to the sea? 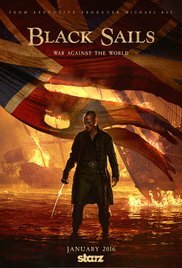 And most importantly, will Captain Flint be able to quash dissension before his crew topples him? 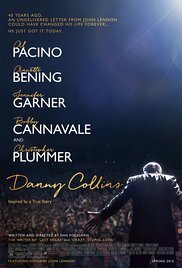 Danny Collins (♦♦♦): Al Pacino stars as Danny Collins, an aging rock star who receives as a birthday present a letter John Lennon penned to him after reading what Danny said in an interview with a magazine. Upon reading the letter, Danny Collins abandons his life of vices, and settles indefinitely in New Jersey to attempt reconnecting with his estranged adult son and his family. Danny Collins is an OK family drama with some good moments courtesy of seven- year-old Hope, Danny's granddaughter, a child with ADHD, and lighthearted innuendo between Danny and Mary—the hotel manager of the Hilton where Danny is lodged. Don't expect much and you may well enjoy this movie. What an interesting collection of titles! As always, your reviews are crisp and concise. Thank you, Dorothy! I'm trying to keep them brief yet interesting. I have Jonathan Strange in my queue. I loved the book!! (I wasn't blogging yet when I read it, so I can't link my review.) I also thought Danny Collins was pretty good. Last week I watched The Danish Girl and Steve Jobs. I would give both of the 3.5 stars. I know you loved Jonathan Strange because it has come up in exchanges at various points. I don't know if that may bode well for how you like the series, but I thought it was quite good. It surprised me, though, that it was so dark. Goodness me! I thought Steve Jobs was strong four, but I know it required lots of focus with so much dialogues. I also enjoyed Jonathan Strange - adaptation and book. 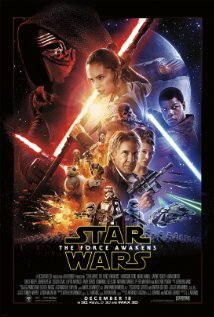 The Star Wars movie - I liked it, lots of very good special effects plus some good characters but for me it felt like a retelling of the original tale. Jonathan Strange was so dark! I found Star Wars wanting in the plot department, but entertaining nonetheless. I enjoyed The Force Awakens and Black Sails; I am actually watching the 2nd series of the latter right now. And I LOVED Jonathan Strange & Mr. Norrell. I thought the special effects were great and while I've enjoyed shows by HBO and Starz, I wouldn't want to see them do this - I think they wouldn't get the British eccentricities of it. I have Season 2 of Black Sails in my queue to watch after I finish Season 3 of Penny Dreadful. You may have a good point about the production of Jonathan Strange and Mr. Norrell, but Games of Thrones has a British feel, filmed in Ireland, with an international cast, and it's amazingly done, so Mr. Norrell would not have suffered in translation, I think. The same can be said about Penny Dreadful, and The White Queen. Too bad the Danny Collins movie wasn't a bit better. I havent seen it yet but Benning and Pacino are usually pretty entertaining. And they were, but not enough to make me like the movie a lot.